How unusual, I thought, for the Food Section of the Washington Post to print a recipe for a cooked green with warnings about its dangers. Forage for the plant “carefully,” the Post advised. It’s “edible only after you detoxify it.” Plants over eight inches may be “too toxic” to eat. The Post recipe outlined the detox procedure. It includes three boilings, with cooking water discarded after each, and a final ice-water bath. 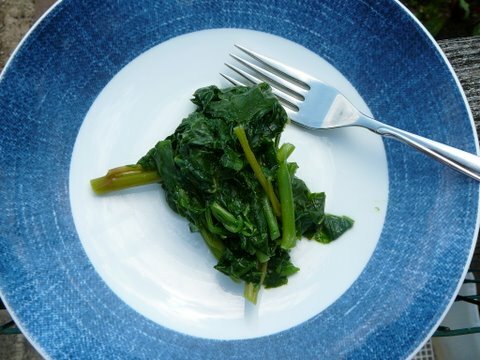 The thrice-boiled greens, according to the Post recipe, are then warmed again, by sautéing. I had to smile for several reasons. First, I was amazed the newspaper printed a recipe for “Sautéed Poke” (May 19, p. E6), a native plant considered to be poisonous. Second, I hadn’t heard of anyone eating poke—a common native weed know to some as pokeberry, inkberry, scoke, pigeonberry, garget, coakum, cancer jalap, and poke salad, salat, salit, or sallat—since I was a kid and one of my great-grandmothers asked my mom to cut her a “handful of poke.” My mother explained that Grammie boiled it several times “to get the poison out” before eating it. And my mother gathered this plant for her grandmother to eat? Well, if it was good enough for Grammie, it’s good enough for me, I thought. I decided to make a “mess” of poke salad. 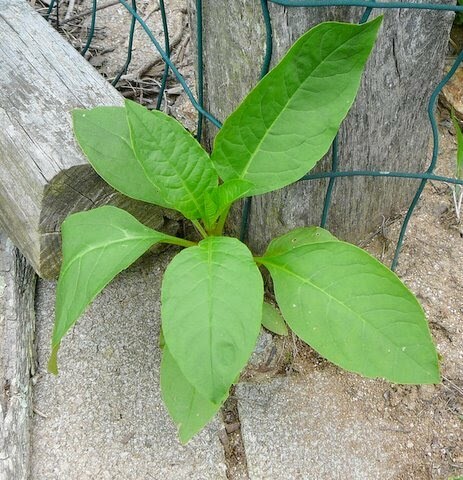 When I starting looking for young poke plants, I found a near-perfect specimen growing by a garden fence post. I followed the fence around the garden and cut young poke plants as I went. Soon I was ready to cook the poke. I followed the procedure recommended by the Post—two one-minute boilings followed by one three-minute boiling, discarding the cooking water after each boiling—then the cooling. I didn’t add flavoring as recommended by the Post, or sauté the boiled poke and flavorings together, because I wanted to savor only the poke. What does poke salad taste like? Straight from the ice water it tasted mostly like “spinach lite and soft” with an occasional hint of “asparagus lite and soft.” I suspect the asparagus taste came from small blossoms that had begun to form on the largest plant and from the thicker stems. I didn’t know how this “edible weed” experim ent would end. How unexciting—poke didn’t harm me in the slightest. It was an interesting experiment that linked me to an ancient family food source that probably died out with the advent of frozen foods and fresh salad and garden greens trucked in year-round from distant states. But the time it took to gather and thrice cook the poke reminded me that it’s so much easier to just reach into the garden and pull a handful of Simpsons Curled and Forellenschuss lettuces without risking a ghastly poisoning. 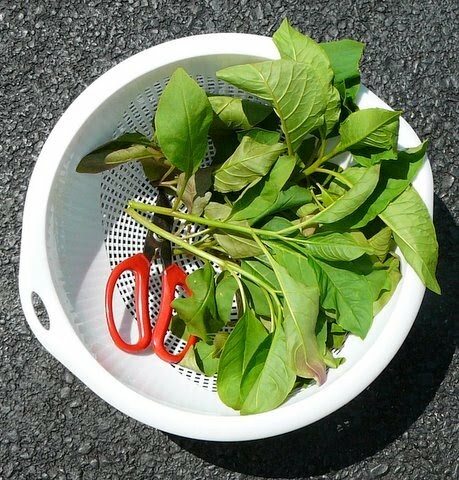 Our gardening ancestors ate other “spring greens” that we generally consider “weeds” today, weeds that pop up in our gardens, such as dandelion, lambsquarters, pigweed, purslane, and sorrel. Maybe I should research them and give them a try. Second thought, if they were really culinary stars, wouldn’t we be growing them in straight rows already? I’ve had my culinary weed adventure for 2010. What springtime weed is a favorite at your table? I lost my copy of “Stalking the Wild Asparagus” many moons ago. I recall however that there were recipes for Pokeweed. That Euell Gibbons classic (from a granola generation perspective) also addressed all of the other greens you've listed. And I've tried all with the exception of pigweed with minimal ill effects. Purslane and sorrel are actually showing up in some high-end restaurant salads these days. Given the preponderance of purslane in my garden, I think I'll give it a try again. Bob, I have my copy still, if you want anything looked up! The chapter on poke is subtitled “Wild Potherb Par Excellence.” Thanks for trying this out – a virtuous and educational experiment!